CONDITIONS IN SHARING THIS SITE: You may copy parts of this blog, but only if you mention the source/this site. This blog is a result of 4 years research and selection of sources on internet. Thank you for your cooperation. 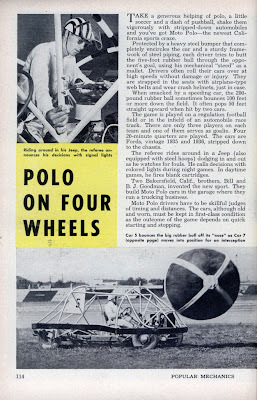 Enjoy yourself with reading the information and watching all the pictures of one century sport history! For which animals you are looking for: a huge ball? Important: each horse/pony/mule (yes they play also in the USA!) size needs his own ball diameter. My research for a horse size ball cost me about three years, and my first pony ball was too small (0.75 meter). For which size of animals a strong ball was needed? Our pony's have the size of a New Forest Pony (Section D category), Norwegian Fjord Horse and large Welsh pony's with shoulder size till 1.45 meter. Our horses are big warmbreed horses between 1.60-1.80 meter high. Minimum size of the ball is the high of the breastbone (just in between and above the breast muscles): so, for the pony's (Section D category) I use a ball with the minimum of 1 meter diameter, for the horses a ball with a minimum of 1.20-1.30 meter diameter. For Shetlander pony's is the size of 0.75 meter OK.
And the ball should be burst resistant, meaning: after hitting a sharp object the ball will not explode and will get empty with a light puff. The horses will not get afraid for the ball. With some balls I have experiences: they are mostly developed for human/fysiotherapy use and NOT TESTED FOR HORSES YET! I don't trust balls which can handle for instance a pressure of 300 kg. Because two pony's of 400 kg (in fast trot) can tackle each other with a lot of power, so the pressure on the rolling ball will be more then 300 kg.... Watch out for that. At this moment I have found a German fysio ball for the pony's, which works well for about 3 years and once there was a leak without any sound (reason: a sharp obstacle in the arena). My beige leather ball for the big horses (watch the picture with the Friesian horses) is handmade and not made with mass production. I found this ball also in Germany, near the Czech boarder (more then 800 km away). These are my own personal experiences, so not officialy tested in a official test laboratory! I'm now in contact with some European fysio ball factory's and told them how some people use their human balls for equine purposes, with all risks! In the future they maybe wants to develop a strong burst resistant ball for pony's and horses. The market is big enough for them: Belgium, Czech, Germany, Holland, New Zealand, Russia, UK, USA (espacially for the pony's an extra ball is needed). In all these countries I have already discovered pushball lovers/initiatives!!! The international pushball network is growing every day now. At this moment we all can learn from each other, and please tell me your story about this theme. Thanks for your comment Franky (from Belgium) and hopefully I have helped you a little. Otherwise let me know! Happy 1903.... I mean 2009! The following old message was written in the New York Times on 31th of December in 1902, and is again actual. Nowadays everywhere around the world people are playing pushball with their horses, like they did in New York on the Christmas Ride in Durland Riding Academy. Each country has his own variation of this ancient sport. The amount of discovered equine pushball related countries are growing: Czech, Germany, Holland/Netherlands, New Zealand, Russia, Ukraine, USA. I wish you all the best and let the international pushball network grow! Both equine team games will be played with a ball. A large Pushball will be kicked by the horse itself. 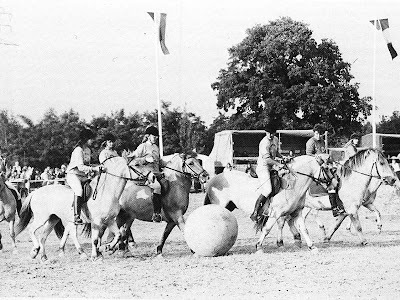 And a Horseball is an small ball with leather handles, which will be catched by the rider. And a high basket, like basket ball, as an goal. This year there will be a Premium in the Netherlands: Hélène de Fremery arranged that both equine games will give a show togehter on one day. On an international Driving Contest! It will be the World Championships Four-In-Hand on the Estate Heerlijkheid Mariënwaerdt of Family Van Verschuer in Beesd (NL): on Sunday 7th of September 2008. Watch http://www.wkvierspannen.nl/ (also English version). Pushball picture shows debutants on the '20th Frisian Horses Day' in Hoofddorp (NL): first experience with the huge leather ball from Pushball Club Rotterdam. Source of this article is: http://4beatgait.blogspot.com/ => see hoofball junior! 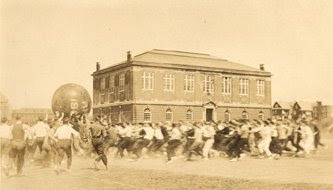 The oldest pushball game is pushball (on foot) (USA, 1891) with a large amount of people on a big square playing a 6 feet large ball above their head. See the blog of Thorn Pricks with "Who Rembers Pushball?" with the whole history of pushball in general. Still in the USA Army the soldiers are training with (strategic) pushball (on foot). And also an University competition of pushball (on foot) still exists in the USA at this moment. I found pictures in Life magazine (1941) of the US Army playing this game in the Second World War(see the pictures in a next article on this blog). This added movie is made in 1933 in Chicago, it gives a good impression in playing pushball (on foot). Chicago, IL: Exclusive pictures of a hectic pushball game in which the Freshmen of Loyola University defeat the Sophomores in a wild battle for a prize beer keg, after many players suffer bumps and bruises. Emiel Voest learned me this method of double longe 6 years ago. After a while it was my idea to create a variation on pushball on horsback, you may call it "pushball behind horseback" (if this word exist in English). Emiel learned my Norwegian fjord horse Ingalill working with the ball and the double longe. See the picture is a result, even we both can turn corners with this horse. This horse is a daughter of the mare Ose on the picture of 1982, with the ball in the center. Ingalill is in the training of the other horses and pony's the so called "Mirror Horse" (as Monty Roberts should say): the behaviour of this experienced pushball horse is an example (mirror) for the debutant animals who are reallly exited by watching this large (pony size) yellow ball. These learning animals have trusted and watched my patient horse: this proces was a succes for about 55 pony's and horses in 4 years time! 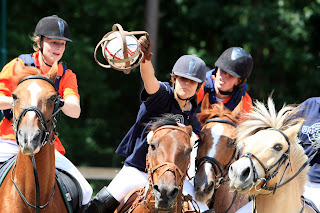 The first time a Dutch Fjord Horse Team was invited for a real pushball game: Germany - Holland. They have scored against the Germans! And that for a first play against a team of the German Competition. It was fun. Look how fanatical the horse kicks the large leather ball! 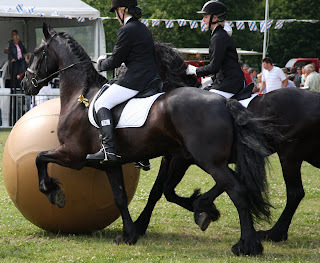 Now we play pushball again in the Netherlands and with an other leather ball for the Warmblood horses (1,30 meter high ball, like the one of the British Lancers a century ago). At this moment each country has it's own pushball tradition in playing pushball with horses. On this site pushball trainers can share their training methods, game tactics, game rules with other trainers all over the world. There are a lot of training systems. Each trainings system can add something new to an existing system in a other country. Even if it has his origin in an completely other discipline. For example, this is my own out-of-the-box psycology: the choice of a certain horse (for his field position) depends firstly on his experience, but secondly on his character! And after that, finaly the character and experience of his rider. Why? An attacker (meaning the horse) wants to fight for the ball and is greedy. And a defender (horse) isn't affraid for an opposit horse, so he won't move while the other is approaching him fastly. "Go with the flow" is a method used by less experienced horses and riders. Then there won't be a hard confrontation. So, my opinion: use the power you already have as a benefit. And protect the weak parts, and let them grow.